Note: This DIY tut makes use of ceramic paints and requires the use of an oven. Spend some time sketching your design out - this will make you confident when it comes to putting it onto the mug. 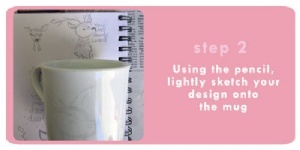 Draw the design, lightly, in pencil onto the mug. You can edit it and move things around at this stage if you find they aren't going according to sketch. 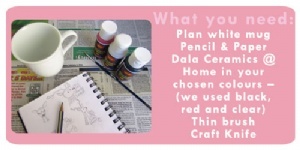 Pour out some of the Ceramics @ Home (about the size of a R2 coin) onto a palette of choice. If you haven't used the product before - use a bit of scrap paper to test out and get comfortable in how the brush and Ceramics@Home interact so that you feel completely confident when you begin to paint onto the mug. When you are ready, paint your design/ outlines onto the mug. Allow to dry for about 30 mins. 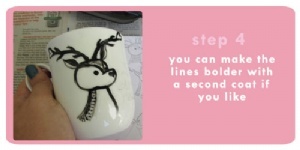 If you would like your design / outlines to be bolder you can paint over them a second time. 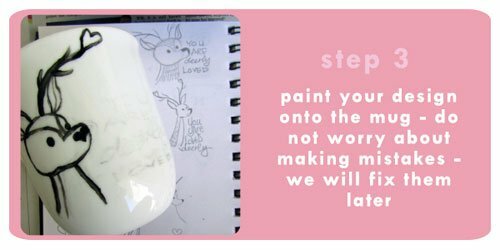 Make sure the first layer is completely dry to the touch before applying a second coat as this may remove the first layer. Leave to dry for another 20 - 30 mins. At this stage the paint must be completely dry to the touch. With the craft knife - edit the painted lines. 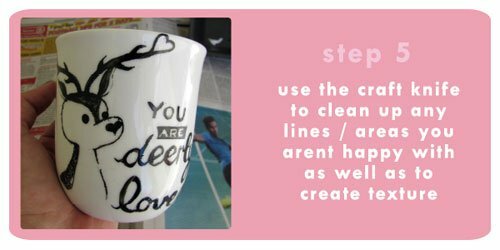 You can edit any area by gently scraping the paint from the surface of the mug. Use the very tip to remove paint from tiny areas. Or use the length of the blade obliquely to remove larger areas of paint. 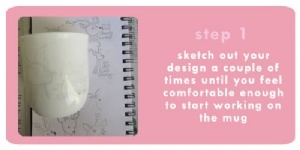 If your design is made up of many colours, fill the colour in now that the outlines have been finalised. Leave to dry for 20 - 30 mins if you are following Step 7. If you are not following Step 7, leave the mug for 24 hours before curing. 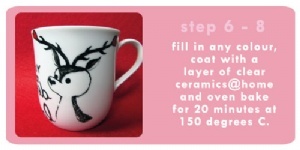 To give the illustration a final finishing touch, apply a clear coat of Ceramics@Home to the mug. 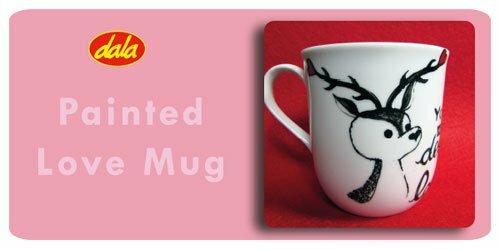 Place mug on a tray in the oven and bake at 150 degrees Celcius for 20 minutes. It is fully cured now and will be able to withstand hand washing and dishwashers. This item has 1035 views.